Over the last few years, Toronto’s food truck scene has gone from a handful of trucks selling stuff like hot dogs and fries to something much, much more interesting (there are enough to necessitate a website like this one to keep track of them). It’s certainly been a welcome phenomenon, and has made events like the recent Woofstock much more interesting, food-wise. On this particular day, Hogtown Smoke had a few interesting looking items on their menu, though I decided to go with the Brisket Po Boy. The sandwich featured a fairly substantial amount of brisket dipped in au jus sauce, cheese, onions (which I honestly couldn’t even taste), and horseradish aioli. 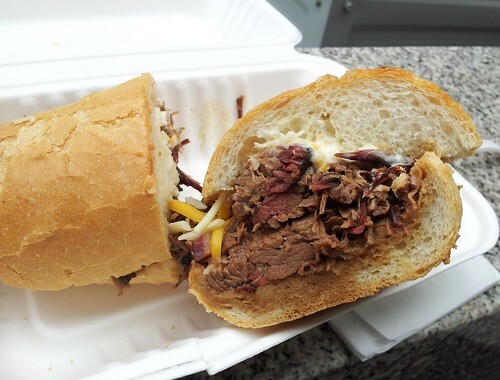 It was a perfectly tasty sandwich, though I kinda wish I had just gone with the plain brisket. Good brisket is hard to prepare; it has the tendency to be a bit dry and tough, but this was moist, with just the right amount of fattiness and a nicely subtle smokey flavour. It was good enough that the other stuff felt more like a distraction than anything else; with brisket this good, all you really need is meat and bread, with maybe a little bit of barbecue sauce for flavour. There were a lot of flavours going on in this sandwich, and ultimately they just took away from the brisket. The bread was perfect po boy bread — lightly crispy on the outside and soft and fluffy on the inside. The whole thing was pretty good, but I’ll definitely be going for the plain brisket if I ever find myself back in the vicinity of this truck.